Claudio MONTEVERDI: Vespro della Beata Vergine (1610) (rec. 1983-84); Selva morale e spirituale (pub. 1640-41) (exc., rec. 1982). Emma Kirkby (sop), Rogers Covey-Crump, Nigel Rogers (ten), David Thomas (bs), Taverner Consort, Choir & Players, Andrew Parrott (dir.). EMI 2 12959 2 (2 CDs) (http://www.emiclassics.com/). Vespro is a collection / résumé. Parrott built a specific service, adding chants; the pared-down angle has influenced a good many. No texts! Lectio I, II, III. 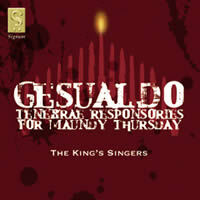 Carlo GESUALDO: Tenebræ Responsories for Maundy Thursday (pub. 1611); Benedictus. Christus factus est (rec. 2004). The King’s Singers. Signum Classics SIGCD048 (http://www.signumrecords.com/). Distributed in the US by Qualiton (http://www.qualiton.com/). Chants before each trio of Gesualdo responsories provide a frame, and impart the hint of ritual. Outside their usual zone, TKS do all right. Antiphons – Psalms – Antiphons, Lectio I-IX. 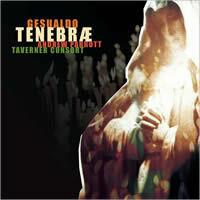 Carlo GESUALDO: Tenebræ Responses for Good Friday (pub. 1611) (rec. 1996). 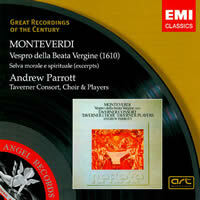 Taverner Consort & Choir, Andrew Parrott (dir.). Sony Japan SRCR 2517 (http://www.sonymusic.co.jp/). Purchased from HMV (http://www.hmv.co.jp/en/). Parrott goes further on context, a Lectio preceding every Response. Gesualdo hits harder this way, aided by a choir (chant) / consort split. 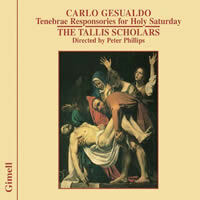 Carlo GESUALDO: Tenebræ Responsories for Holy Saturday (pub. 1611); Four Marian Motets (bef. 1603) (rec. 1987). The Tallis Scholars, Peter Phillips (dir.). Gimell CDGIM 015 (http://www.gimell.com/). Distributed in the US by Harmonia Mundi (http://www.harmoniamundi.com/). As in the intégrales, Saturday’s nine come in a row. Refined singing, but Phillips is a Palestrina man. Worth having for the earlier motets. 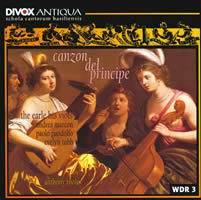 “Canzon del Principe.” Works by Giovanni de MACQUE, Rinaldo TREMATERRA (dall’Arpa), Giovanni Maria TRABACCI, Orlando di LASSO, Orazio BASSANI (della Viola), Ippolito (?) TARTAGLINO, Carlo GESUALDO, ANON., Scipione STELLA, Francesco LOMBARDO, Fabritio FILLIMARINO, Jacopo PERI, Giaches de WERT. Compiled by Luigi Rossi, Naples, c. 1615 (rec. 2000). “The Earle His Viols”: Irene Klein, Jessica Marshall, Brigitte Gasser, Randall Cook (viols), Evelyn Tubb (sop), Paolo Pandolfo (vla bastarda), Andrea Marcon (hpsi & org solo), Marie Nishiyama (triple hp), Johannes Strobl (hpsi & org continuo), Anthony Rooley (concept & dir.). Divox CDX 79907 (http://www.divox.com/). Distributed in the US by Spinning Dog Records (http://www.spinningdogrecords.com/). Rooley guides a pet project: Gesualdo in the fast company of his Naples peers. Complex history unfolds, with Tubb the wild card. Full notes.